Never heard of this guy? Well you are not alone. 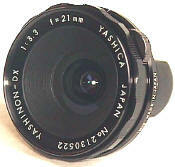 This is the famous, eh, not so famous Yashinon DX 21/3.3!! wow. eh, not so wow, but maybe it should be. Back in the days when superwides were NOT retrofocus, this was made for the 42mm screw mount, aka Pentax screw mount, aka Contax S screw mount, Yashica. yep, truth is stranger than fiction. The funny thing is that underdog Yashica did a great job with this lens. 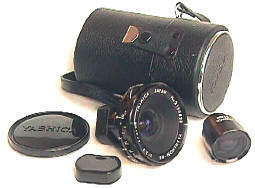 It is very well made, with a Leitz quality finder. This little beauty weighs in at just 5 ounces, focuses by scale to a commendable 2.5 feet, has a barrel depth of only 7/8th of an inch, and uses easily obtainable 55mm filters. It also stops down to f/16. So what you say? Well wet behind the gadget bags, the answer is rangefinders, aka Leica M's. 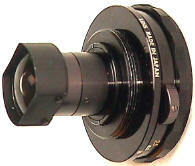 Compact non-retrofocus mirror lock up superwide SLR lenses (boy that was a keyboard full) are ideal compact superwides for cost conscious photogs. Of course, that does not include me--if it's not the most expensive lens ever on God's earth, obviously it is too cheap to be any good. What's good about them? Light weight, small size, very low cost compared to a Leica 21, and even the necessary super wide viewfinder. That's right, SLR mirror lock up superwides need the auxiliary viewfinders just like the RF's. A lot of people don't use superwides that much, so have a hard time justifying $2000 plus on a new Leica 21/2.8. When someone mentions "great 21 viewfinders," Yashica is probably not the first name to come to mind -- to put it mildly. Yet, this unheralded 21 finder is GREAT and well worth looking for. Yashica made a very nice package of it all: a custom case to hold lens and finder, and special hard plastic front and back caps. OK, so how do you put it on a M6? Easy, remember it uses the standard Pentax 42mm screw mount. So, mount the lens on the Canon P adapter, mount that on the Canon B adapter, then add a Leitz bayonet adapter, and there you are. The alternative is a custom made adapter from Pentax 42mm to Leica screw mount, which runs about $350. More elegant, but less versatile. Revised: November 26, 2003 . Copyright © 1998-2002 Stephen Gandy. All rights reserved. This means you may NOT copy and re-use the text or the pictures in ANY other internet or printed publication of ANY kind. Information in this document is subject to change without notice. Other products and companies referred to herein are trademarks or registered trademarks of their respective companies or mark holders.